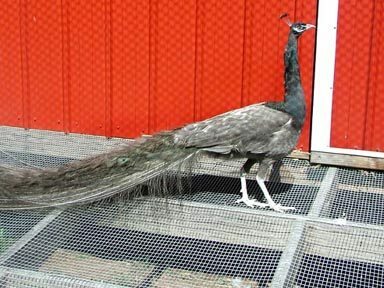 This mutation has a brown fan shaped crest. The male has the same color pattern as the Black Shoulder. The bird is predominantly chocolate brown on its head, neck, and shoulders. Unlike the Oaten, the head and neck feathers have a distinct aquamarine tint. The saddle and train feathers have an opal tint appearance depending on the light. The ocelli are formed by a dull black surrounded by a broad ring of opal and deep copper color. Black Shoulder Opal breed true when bred Black Shoulder Opal to Black Shoulder Opal.